Thanksgiving is coming!! 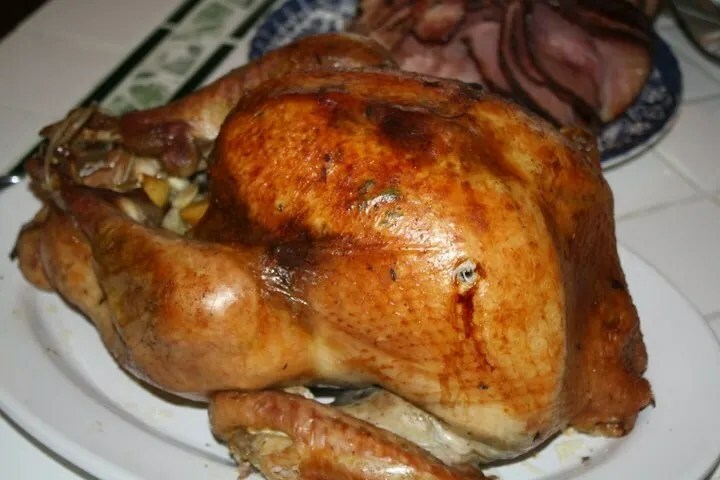 We have been using this turkey recipe for the past couple years and it is absolutely my favorite & I’m not the only one, I have a couple friends who are always asking me for the recipe! Its the only way we will cook the turkey 🙂 I love how easy and simple it is. Prep the turkey. Prep the turkey cooking bag, the bag speeds up the cooking process so your bird will be done sooner so plan accordingly. Salt and pepper the turkey all over the top and in the cavity. Drizzle 2 Tbs of melted butter over the turkey and cut up the rest of the butter and place under the skin of the turkey. Just make a small slit in the skin and shove the butter in, throughout the top. In the cavity, add onion(cut in half), lemon(cut in half), fresh rosemary, garlic(cut in half, no need to peel the skins off), orange cut in half). Sprinkle fresh rosemary on top of turkey and in the bag for cooking. Cook according to directions, ours takes less than 3 hours until done. I will have to try out this recipe for Thanksgiving! Prawns sound good 🙂 I love hearing about other peoples traditions!